Today I found an interesting challenge site called Runway Inspired Challenge. I must say that I usually am not into whimsical or ultra modern designs, but something in this one caught my eye and I decided to go with it - well and this is the result. 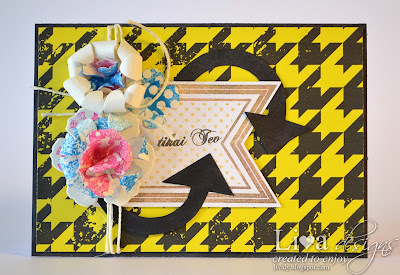 I used lots of Sizzix dies and stamps to make this card and especially these flowers. I started out by printing this houndstooth pattern I designed. Then I die-cut several smaller sized flowers from watercolor paper using Tattered Florals die. 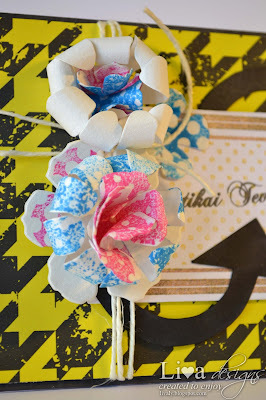 Then I stamped some of them using stamps from Sizzix Flowers, Daisies stamp and die set. I used Picked Raspberry and Salty Ocean Distress inks. Then I stamped and die cut one of the banners in Sizzix Framelits Banners set. I also stamped sentiment "Just For You" on my banner. Those arrows are actually drawn from negative shape of TH grungeboard shape. I cut it out using scissors and then colored in using black ProMarker. I wrapped some white string around my card and that was it. Very well done Sweetie, nothing like stepping outside our comfort zone huh? You've done a beautiful job, as always. really love the flowers, Love how the ink work so naturally on the petals! Oh I love how you've incorporated the arrows on you card, gorgeous flowers. The bold houndstooth background looks awesome! I'm so happy you found our challenge and decided to play along. Thanks for joining us on the Runway! Love that super bold houndstooth paper with those blooms! So glad you joined us over at the Runway Inspired Challenge!